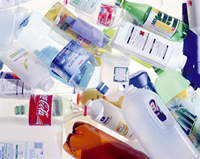 Single-stream recycling simplifies the process of collecting/sorting recyclable materials. In single-stream recycling, residential and commercial customers put recyclable materials into one tote to be picked up. The need to seperate materials is no longer necessary. Single stream recycling is much more user friendly and convenient than having to keep materials in separate containers. Single stream has become widely popular across the United States and has proven to be a much more efficient way to get people to recycle, which means less landfill waste and a better environment! Every year we generate around 14 million tons of food waste; which is 106 pounds of food waste per person. 570,000 tons of this is composted for a 4.1% recovery rate. The rest, or 13.4 million tons, is incinerated or landfilled and occupies 6.3 million cubic yards of landfilled MSW (municipal solid waste). Americans make more than 200 million tons of garbage each year, enough to fill Bush Stadium from top to bottom twice a day! Each year American throw away 25,000,000,000 Styrofoam cups. Even 500 years from now, the foam coffee cup you used this morning will be sitting in a landfill. In 1995, Americans recycled 9.5% of all plastic packaging, including 26% of all plastic bottles. Most of the plastic recycled is #1 PETE soda bottles and #2 HDPE milk bottles. Most of the #3 through 7 plastics are not easily recyclable. In 1996 Americans recycled 21.6 million tons of corrugated cardboard for a 73% recovery rate in 1996 (industry data) By tonnage, corrugated boxes are the most recycled product in the waste stream. Corrugated boxes produced in the U.S contain 37% recycled content. In 1998, 62.8% of the 102 billion aluminum cans produced were recycled. That totals 64 billion cans , 46 billion more than in 1991, Aluminum can recycling saves 95% of the energy needed to make aluminum from bauxite ore. Energy savings in 1998 alone were enough to light a city the size of Pittsburgh for 10 years! 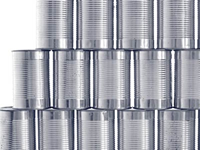 The Container Recycling Institute (CRI) estimates that the 36 billion aluminum cans landfilled last year had a scrap value of more than $600 million. Over the past twenty years we've scrapped aluminum cans worth over $12 billion on today's market. Some day we may be mining our landfills for the resources we've buried. There is no need to bag your recycling. However, if bags are used they should be a clear or see-through plastic bag. Dry & clean newspapers, computer paper, magazines, mixed paper, junk mail, wrapping paper at Christmas. Empty, rinsed, caps, lids, & foil, food and beverage cans, hair spray cans, food spray in a can (PAM); label left on is OK.
Rinsed, lids removed, clear and colored plastics with #1,2,3,4,5, 6 & 7 stamped on bottom, milk and soap jugs, food, beverage, and household cleaning bottles, plastic bags, potato chip bags, individual cheese wrappers. Tissue boxes, cereal, shoe and beverage boxes, food boxes without food stains, as in hamburger helper box, cake box, pizza box, laundry soap box. GLASS IS NOT ACCEPTABLE IN RECYCLING. DO NOT PLACE ANY GLASS IN YOUR RECYCLE BINS. STYROFOAM IS NOT ACCEPTABLE IN RECYCLING. THIS SHOULD BE PLACED INTO YOUR TRASH TOTES.NO FOOD WASTE, DIAPERS, MEDICAL WASTE, KLEENEX, HAZARDOUS MATERIALS, WOOD, CLOTHING IS ALLOWED IN THE RECYCLING.